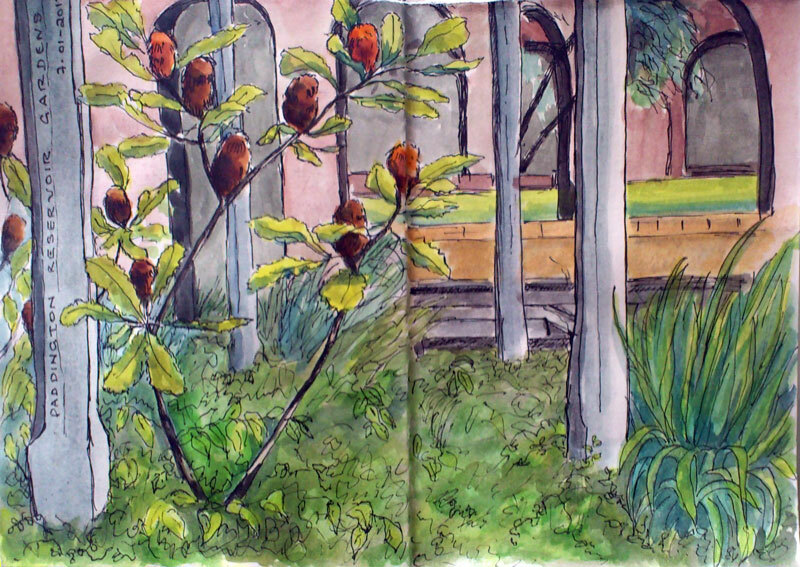 Finally some nice weather in Sydney and we went to the Paddington Reservoir Gardens to draw. Paddington is an inner suburb and they have made this wonderful garden below street level, right on the busy main street, but you'd never know it was there. It is almost deserted. The main architectural feature of the garden is rows of arches, and it is easy to get tangled while you're drawing them. I'd been once before and its amazing how just a small change in viewpoint completely changes the image as the arches pass by one another and change perspective. 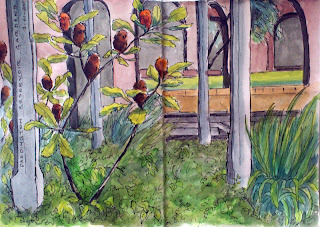 I made the big banksia bush the feature of my drawing this time. Another great thing about sketching here is that there is a supply of comfortable mesh metal chairs that you can more around to get the viewpoint you want or a shady patch.